We will reach two minor milestones this week in the NFL — the first week of full action since the start of the bye weeks in Week 5, and the first Thursday night game since the Saints visited the Packers to open the season back at the beginning of September. At the risk of jinxing myself it seems like the league is starting to make a lot more sense now than it was at the start of the season. Oakland at San Diego - I really don’t like either of these teams, and I am short on respect for their entire division. There are two things that should make the difference here, though. First, San Diego is at home where they are 3-1. Second, and more significant, is Carson Palmer. He is not yet consistently looking like an NFL quarterback — though I don’t really understand why people expect him to be so soon after joining the team and after a long layoff. Take the Chargers. Jacksonville at Indianapolis - Until the Colts win a game there is no reason to believe that they are capable of doing so — even against a lackluster team like this one. The Jaguars have all sorts of issues, but they can rely on somewhat better quarterback play, and are playing tougher right now. Take the Jaguars. Denver at Kansas City - Before this past weekend I would have picked the Chiefs without hesitation. Their blowout home loss to the Dolphins was beyond bizarre, though. I am concerned about that given the way they started their season, but I still have to give them a mulligan here. Tim Tebow still just isn’t good enough. Take the Chiefs. Pittsburgh at Cincinnati - No matter how well they do this year I really can’t respect the Bengals, so I will pick against them here. Pittsburgh will be angry after losing late to the Ravens and will be looking for revenge. They are a tough team, and I don’t believe Cincinnati will react well to getting punched in their mouths. Take the Steelers. Buffalo at Dallas - Buffalo lost a disappointing game to the Jets last week. They haven’t lost two in a row this year, though, so I expect them to bounce back strong. I don’t expect the same strength from the Cowboys, and the loss of Miles Austin is going to have a psychological cost to this team. Take the underdog Bills. New Orleans at Atlanta - Both of these teams are obviously talented, and both are coming off of big wins. This game is a toss-up, so I have to give the edge to the home team. Atlanta is playing very well lately, and seems to have their mojo after three straight wins. New Orleans has obvious holes, and Atlanta is talented enough to exploit them. Take the Falcons. St. Louis at Cleveland - The Rams were on the verge of winning two in a row before blowing it against the lousy Cardinals. That is going to be a big hit to the shaky confidence of this team, and I don’t expect them to bounce back. Cleveland is good enough to take care of business here. Take the Browns. Washington at Miami - I don’t have any respect for the Redskins these days, so I will have faith that Miami can build on the momentum from their shocking and impressive win at Kansas City. They have not been nearly as bad as their record suggests in recent weeks. Take the Dolphins. Houston at Tampa Bay - I really want to like the Bucs, but something clearly isn’t right with them. They have come out flat against the Saints and the Niners, and seem to have problems that they are struggling to overcome. Houston isn’t perfect, but they are playing like the playoff team that they are destined to be this year and will come out on top here. Take the Texans. Tennessee at Carolina - After a strong start Tennessee has lost three of four and is reeling. Carolina has all sorts of problems, but they are still proud and playing tough. They are good enough to win this one. Take the Panthers. Arizona at Philadelphia - Coming back against the Rams does not mean you are a good team. 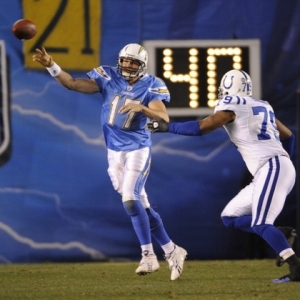 Kevin Kolb has been lousy all year, and now he’s facing the team that knows him best of all. That could get ugly. Take the Eagles. Baltimore at Seattle - The Ravens are a tough and talented team riding the emotion of a big win. The Seahawks are a really lousy team with a world of problems. Take the Ravens. New York Giants at San Francisco - Both teams are playing well and believe in themselves right now. The Niners have more spark, though, and are playing at home. I can’t believe I am saying this, but I also think San Francisco has the better quarterback right now in terms of game management and avoiding mistakes. Take the Niners. Detroit at Chicago - The Lions need this win here, and they will be rested after a bye week and facing a Bears team coming off a short week. Detroit has been flawless on the road, and handled Chicago handily at home earlier this year. Take the Lions. New England at New York Jets - This is suddenly a massive game in a totally wide-open AFC East. That will elevate the stakes above where they always are in this rivalry. New England has been playing poorly lately, so they really need to bounce back. I expect them to do so, and I think the Jets are vulnerable to the Pats. New York will certainly be outcoached. Take the Patriots. Minnesota at Green Bay - Take the Packers. Why would you consider anything else?